Asphalt has consistently been a favored choice of many residential and commercial property owners. Not only is the material relatively inexpensive, it’s also very durable. A few years ago, it saw a dip in popularity, with people opting for concrete or traditional brick or pavers for aesthetic appeal. However, you can now utilize colored or stamped asphalt pavement on your property. 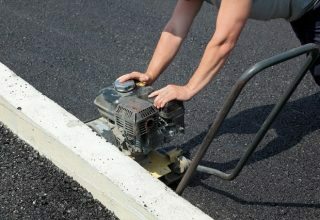 Asphalt is an inexpensive material to use for paving. It’s composed of stone aggregates, bitumen, water and a sticky form of petroleum. The material is also very easy to use and it doesn’t take much time to install a good quality, durable pavement. It takes about one or two days to construct, which saves time and money. The material is slightly more expensive than gravel but is much easier to maintain, lowering future expenses as well. It is, however, about 30 to 40% cheaper than concrete; brick, pavers or stone are of course much more expensive options. A well installed asphalt pavement would last for several years, needing only minor repairs here and there to maintain a smooth, even surface for a long time. Asphalt pavement is made up of several layers and only the top-most layer sees wear. That layer can last for 15 to 20 years, depending on the quality of the materials used. The top can be replaced or repaired as and when required. Its smooth surface ensures that your vehicle’s tires have maximum contact with the road surface. That offers skid resistance, reducing the likelihood of vehicles swerving out of control. Moreover, with recent developments, you can install pavements with a textured surface, which allows for better skid resistance in wet, unfavorable conditions. The porous asphalt surface reduces the “bounce back” of rain, which in turn reduces the blinding spray that is common with other surfaces. New advances also ensure that water is quickly dispersed from the surface, and this improves the driving conditions drastically. According to research, recycling asphalt reduces energy costs and carbon dioxide emissions by a fair margin. It’s 100% reusable so you can easily create a pavement from recycled asphalt, reducing the cost and the environmental impact. There’s actually no end to how many times it can be reused. The material doesn’t lose its quality or effectiveness upon recycling, making it one of the best modern-day construction materials to use.